Austrian composer Franz Joseph Haydn sadly passed away on this date 31st May in 1809. Joseph haydn was born on 31st March 1732 and grew up to be one of the most prolific and prominent composers of the Classical period. He is often called the “Father of the Symphony” and “Father of the String Quartet” because of his important contributions to these forms. He was also instrumental in the development of the piano trio and in the evolution of sonata form. A lifelong resident of Austria, Haydn spent much of his career as a court musician for the wealthy Esterházy family on their remote estate. Isolated from other composers and trends in music until the later part of his long life, he was, as he put it, “forced to become original” and developed his musical talent with support from Austrian and Hungarian aristocratic families before rising to fame in London and Vienna. At the time of his death, he was one of the most celebrated composers in Europe. Joseph Haydn was the brother of Michael Haydn, himself a highly regarded composer, and Johann Evangelist Haydn, a tenor. He was also a close friend of Wolfgang Amadeus Mozart and a teacher of Ludwig van Beethoven. American film actor, director, producer, composer and politician. Clint Eastwood, Jr. wasborn on May 31, 1930). He first came to prominence as a supporting cast member in the TV series Rawhide (1959–1965). He rose to fame for playing the Man with No Name in Sergio Leone’s Dollars trilogy of spaghetti westerns (A Fistful of Dollars, For a Few Dollars More, and The Good, the Bad and the Ugly) during the late 1960s, and as Harry Callahan in the Dirty Harry films (Dirty Harry, Magnum Force, The Enforcer, Sudden Impact, and The Dead Pool) throughout the 1970s and 1980s. These roles, among others, have made him an enduring cultural icon of masculinity. For his work in the films Unforgiven (1992) and Million Dollar Baby (2004), Eastwood won Academy Awards for Best Director and Producer of the Best Picture, as well as receiving nominations for Best Actor. These films in particular, as well as others including Play Misty for Me (1971), Thunderbolt and Lightfoot (1974), The Outlaw Josey Wales (1976), Escape from Alcatraz (1979), Tightrope (1984), Pale Rider (1985), Heartbreak Ridge (1986), In the Line of Fire (1993), The Bridges of Madison County (1995), and Gran Torino (2008), have all received commercial success and critical acclaim. Eastwood’s only comedies have been Every Which Way but Loose (1978) and its sequel Any Which Way You Can (1980), which are his two most commercially successful films after adjustment for inflation. In addition to directing most of his own star vehicles, Eastwood has also directed films in which he did not appear, such as Mystic River (2003) and Letters from Iwo Jima (2006), for which he received Academy Award nominations, and Changeling (2008). He has received considerable critical praise in France, including for several films which were not well received in the United States, and he has been awarded two of France’s highest honors: in 1994, the Ordre des Arts et des Lettres medal, and in 2007 the Légion d’honneur medal. In 2000, he was awarded the Italian Venice Film Festival Golden Lion for lifetime achievement. Since 1967, Eastwood has run his own production company, Malpaso, which has produced all except four of his American films. He also served as the nonpartisan mayor of Carmel-by-the-Sea, California, from 1986 to 1988. Eastwood has seven children by five women, although he has only married twice. Best known for his wonderfully outlandish illustrations of all sorts of wierd & wonderful contraptions, the English cartoonist W. Heath Robinson, was born May 31st 1872 In the UK, the term “Heath Robinson” has entered the language as a description of any unnecessarily complex and implausible contraption, similar to “Rube Goldberg” in the U.S. “Heath Robinson” is perhaps more often used in relation to temporary fixes using ingenuity and whatever is to hand, often string and tape, or unlikely cannibalisations. Its popularity is undoubtedly linked to Second World War Britain’s shortages and the need to “make do and mend”. Most of his cartoons have since been reprinted many times in multiple collections, and the machines he drew were frequently powered by steam boilers or kettles, heated by candles or a spirit lamp and usually kept running by balding, bespectacled men in overalls. There would be complex pulley arrangements, threaded by lengths of knotted string. 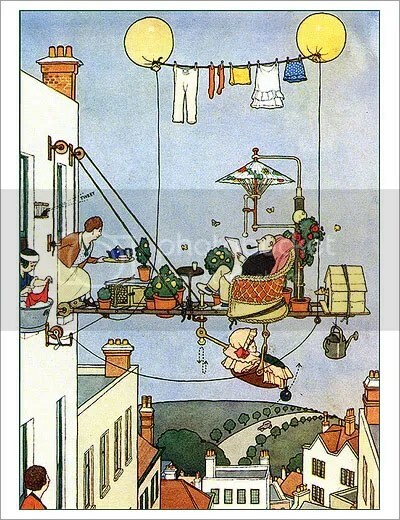 Robinson’s cartoons were so popular that in Britain the term “Heath Robinson” is used to refer to an improbable, rickety machine barely kept going by incessant tinkering. (The corresponding term in the U.S. is Rube Goldberg, after an American cartoonist with an equal devotion to odd machinery. Similar “inventions” have been drawn by cartoonists in many countries, with the Danish Storm Petersen being on par with Robinson and Goldberg.) One of his most famous series of illustrations was that which accompanied the Professor Branestawm books by Norman Hunter. The stories told of the eponymous professor who was brilliant, eccentric and forgetful and provided a perfect backdrop for Robinson’s drawings. One of the automatic analysis machines built for Bletchley Park during the Second World War to assist in the decryption of German message traffic was named “Heath Robinson” in his honour. It was a direct predecessor to the Colossus, the world’s first programmable digital electronic computer. Page had a very specific idea in mind as to what he wanted Led Zeppelin to be, and wanted to add acoustic textures. Zeppelin’s sound became a marriage of blues, hard rock and acoustic music topped with heavy choruses – a combination that had never been done back in the 1960’s. Led Zeppelin’s sound has since become a prototype for countless rock bands ever since, and was one of the major driving forces behind the rock sound of the 1970’s. Led Zeppelin broke up in 1980 following the death of drummer John Bonham, and Page refused to touch a guitar out of sadness for the loss of his friend Bonham, but he eventually made a return to the stage at a Jeff Beck show in March 1981 at the Hammersmith Odeon where he joined Yes bassist Chris Squire and drummer Alan White to form a supergroup called XYZ (for ex-Yes-Zeppelin), sadly though the project was shelved. He also played on Roy Harper’s 1984 album (Whatever Happened to Jugula? ), and has performed with them at folk festivals under various guises such as the MacGregors, and Themselves. Page has also recorded with former Led Zeppelin vocalist Robert Plant as The Honeydrippers on the album The Honeydrippers: Volume 1, and with John Paul Jones on the film soundtrack Scream for Help. He has also collaborated with Paul Rodgers to record two albums under the name The Firm. Jimmy Page was appointed an Officer of the Order of the British Empire (OBE) in recognition of his charity work in 2005 and Robert Plant was honoured as a Commander of the Order of the British Empire (CBE) for his services to popular music in 2009. The band are ranked number one on VH1’s 100 Greatest Artists of Hard Rock and Classic Rock’s “50 Best Live Acts of All Time”. They were awarded an Ivor Novello Award for “Outstanding Contribution to British Music” in 1977, as well as a “Lifetime Achievement Award” at the 42nd Annual Ivor Novello awards ceremony in 1997. The band were honoured with the “Best Live Act” prize for their one-off reunion at MOJO Awards 2008, where they were described as the “greatest rock and roll band of all time”. Kraftwerk , (meaning power plant or power station) are an influential electronic music band from Düsseldorf, Germany. The group was formed by Ralf Hütter and Florian Schneider in 1970, and was fronted by them until Schneider’s departure in 2008. The signature Kraftwerk sound combines driving, repetitive rhythms with catchy melodies, mainly following a Western Classical style of harmony, with a minimalistic and strictly electronic instrumentation. frontman Ralf Hütter also revealed recently that they they have almost finished new material and will be releasing a new album “soon”. which will be their first LP since 2003′s Tour de France. Their next LP will be their 11th studio album and their first without Florian Schneider, who left the group three years ago. Tim Burgess, English singer with English alternative rock band The Charlatans was Born 30th May 1967. The band’s line-up currently comprises Tim Burgess (vocals), Mark Collins (guitar), Martin Blunt (bass), Tony Rogers (keyboards) and Jon Brookes (drums and percussion). In the UK, all of the band’s eleven studio albums have charted in the Top 40 in the UK Albums Chart, three of them being number ones. They have also achieved seventeen Top 30 singles, and four Top 10 hits in the UK Singles Chart. The original members of the Charlatans were located in the West Midlands, however many sources state that they formed in Northwich, Cheshire. This is because the band relocated to the home town of new lead singer Tim Burgess (who lived in Northwich) before the 1990 release of The Charlatans’ debut single “Indian Rope”, on the band’s own Dead Dead Good Records label. This means that, based on the definition of the hometown used by Guinness World Records, the band formed in Northwich and consequently, Northwich is recorded as their home town in such publications as British Hit Singles & Albums. The debut single, “Indian Rope” proved an indie hit and the group soon found a major label, Beggars Banquet off-shoot Situation Two, in time for the release of “The Only One I Know” which reached the Top 10 in the UK Singles Chart. A further single, “Then”, and debut album Some Friendly, were released later that year. Around this time The Charlatans were forced to add UK to their name for an American tour due to competing claims by a 1960s rock band also known as The Charlatans. Baker left the band after 1991’s “Over Rising” single to be replaced by Mark Collins (no relation to Rob), and the band brought in producer Flood for their second album Between 10th and 11th (named after the address of the New York Marque, site of the group’s first US concert). Released in early 1992, the album failed to reach the Top 20 in the UK Albums Chart. However, the Top 20 success of the lead single “Weirdo” and a double weekend of gigs (‘Daytripper’) in Blackpool and Brighton with Ride kept them in the public eye. The follow-up album, Up To Our Hips (1994) reached number 8 in the UK Albums Chart. In 1995 the band’s self-titled fourth album saw them become major UK stars again, topping the UK albums chart and spawning the Top 20 single “Just When You’re Thinkin’ Things Over”. Following the album Us And Us Only,The band released their ninth full-length album on 10 April 2006. Titled Simpatico, it was a reggae and dub tinged album and featured tracks like the fan favourite “NYC (There’s No Need to Stop)” and “Blackened Blue Eyes”. Their follow-up to Simpatico was another career-spanning singles compilation entitled Forever: The Singles which was released on CD and DVD on 13 November 2006. In an October 2007 issue of the NME, the band contributed the song “Blank Heart, Blank Mind” to the magazine’s free Love Music, Hate Racism compilation CD. Later the same month, the new single “You Cross My Path” was released as a free download exclusively through the XFM website. On the 3 March 2008, The Charlatans teamed up with Xfm again to become the first UK band to release an album completely free to download via a radio station. This was preceded a week earlier by the second single from the album, “Oh! Vanity”. The album, titled You Cross My Path, is The Charlatans’ tenth studio album and received a physical CD/LP release on 19 May 2008. Their eleventh studio album, Who We Touch, was released on 6 September 2010 and The first single release was “Love Is Ending”. On March 28th 2011 Universal Music re-released a deluxe edition of the band’s Us & Us Only album, originally released in 1999, featuring a collection of bonus tracks including B-sides, live recordings, radio sessions and rare remixes. In March/April 2011 Tim Burgess and Mark Collins played an acoustic tour of the UK. To coincide with the acoustic tour the band released Warm Sounds EP. Featuring six stripped-down and reworked versions of Charlatans tracks including “North Country Boy”, “The Only One I Know” and “Smash The System”. It was available to download from iTunes and The Charlatans website. The 64-year-old writer was given the unusual award after his novel Snuff won the Bollinger Everyman Wodehouse Prize for Comic Fiction. He will accept the prize, which includes a case of champagne, at next week’s Hay Festival. It is the first time Pratchett has won the prize, named in honour of Jeeves and Wooster creator PG Wodehouse, despite being shortlisted on three previous occasions. Prize judge Peter Florence said: “I am thrilled he’s won in this 25th anniversary year of the festival. He’s consistently funny, inventive and with an acute, satirical view of the world.” Pratchett, who picked up a TV Bafta on Sunday for his assisted suicide documentary Choosing To Die, joins previous winners such as Ian McEwan and Gary Shteyngart. 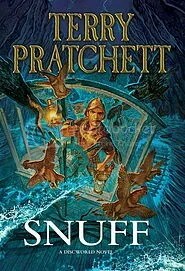 Snuff is his 50th book and the 39th in the series of Discworld novels: comic stories set in a flat world balanced on the backs of four elephants which, in turn, stand on the back of a giant turtle.